Planning to trek in Nepal in May is a great choice. It is the best month for treks and climbs in the Himalaya. This season brings not only with it the sun and warmer temperatures, but fields of blossoming wild flora. The famous giant rhododendrons, giving the landscape a radiant and vibrant texture. By May, you’re into pre-monsoon season in Nepal. Humidity builds and there’s a higher chance of rain. But after the rain, comes coolness and respite, greenery is at its best during this time of the year, and there’s a wonderful earthy scent to the air. May has a bit better visibility compared to its preceding months, making it a better time of year to explore the area’s scenery and natural beauty. This makes trekking in Nepal in May perfect. It is a good time for climbing as the high passes are usually snow free and the mountain views are clear. Thus, this period instigates the most pleasant trekking season. May is the transition month in Nepal and the start of summer. It does start to get humid by late May with plenty of rain and thunderstorms. The days combine with rain and warmth which shows the beautiful rhododendron forest and clear mountain views. In this time the whole country is abundant and plentiful greenery. For the most part in around 2500 m, the daytime temperature is around 25 degree Celsius and the night time temperature is around 8 degrees. Even at 5000m, trekking in Nepal during May is bearable. Trekking in Nepal in May offers you the chance to enjoy the traces of spring and monsoon at the same time. Start your trek early in the mornings and make your days shorter. In wetter areas, it rains more in the afternoons than in the mornings. Bring quick-dry socks and t-shirts and breathable waterproof gear. In the peak of pre-monsoon, waterproof jacket and pants are essential. You can carry an umbrella and also use it as a handy walking stick once the rain dries up. Keep in mind that a wet pack is a heavy pack. A waterproof backpack is the best option for keeping your gear dry but it can be expensive. Additional backpack for separating your wet clothes from rest of your kit is a worthwhile idea too. To protect yourself from leeches and mosquito ’s attack you can spray insect repellent. You can also avoid resting on rocks or leaning on trees that haven’t been in direct sunlight. There are a lot of exciting treks lined up for May. Here are some of the popular ones. Great trekking terrain! You’ll stand face-to-face with the world’s highest mountain- Mount Everest (8,850 m), and see many other majestic peaks. A trek to Everest Base Camp is high on the bucket list for many trekkers. Everest Base Camp trek is a combination of enthralling mountain views. It offers a glimpse of the Buddhist culture in the high windswept valley of Khumbu. With the beauty of Himalayas, the trek is enticing which makes it the trek of the lifetime for the trekkers. May is a good time to see the hedgerows and trees bursting into bloom with Rhododendrons. Also, observe the Legendary Sherpa Culture of the Khumbu Region. Brace yourself for the most exotic Everest Himalaya and adventurous journey of your lifetime! Trek to the foot of breathtaking Everest, the world’s highest mountain. This trek is also known as Annapurna Sanctuary Trek or ABC Trek. The Annapurna Base Camp trek is an easy trek to experience the majesty of Annapurna mountains of Nepal. With the aspiring beauty of Annapurna Himalayas, Annapurna base camp trek is a true example of the beauty of nature. It is one of the comfortable treks with lots of tea houses. This trek takes around the entire Annapurna massif like Thorang La pass (5,416 m) and walking through the world’s deepest Kali Gandaki gorge. The month of may is warm and clear, good trekking month and a peak season for trekking. Views of the world’s highest mountains: Dhaulagiri, Manaslu, and Annapurna. Crossing the Thorong La Pass at 5,416 meters. The Manaslu Circuit Trek takes you around Manaslu, the world’s eight highest mountain at 8,163 m (26,781 ft). The main highlight of this trek is the ‘Larkya La pass’ which is a dramatic pass crossing the Himalayas. This trek is one of the less crowded trails than other treks in Nepal due to its wild and remote areas. But in recent years, it has gained its popularity and there are a lot of teahouses which makes your trek comfortable. No wonder, this trail offers a fabulous experience for those who are looking for an adventurous journey. You can also enjoy the scenic beauty of the Himalayan region. Crossing Larkya La pass over 5,215 m.
Experience the Nepalese and Tibetan mixture of culture. The Langtang Valley Trek is a superb short trek that packs a lot of scenic punch into a small amount of time. It is popular for diverse Tibetan Buddhist culture and vegetation. The rich Tamang culture, beautiful landscapes, and the natural vegetation add to the beauty of the trek. It offers a stunning view of Mt. Langtang-Ri, Langsisa, Langtang Himal, Ganjala peak. Langtang valley trek is also called the valley of glaciers trek. This valley locates only 19 miles north of Kathmandu. In Kyanjin Gompa there are a couple of coffee houses where you can enjoy delicious coffee surrounded by amazing scenery at 3,800 meters. If you are lucky enough, then you can also spot the Red Panda in the Langtang Valley. Visiting Langtang village & Kyanjin Gompa. Panoramic view of the Himalayas from the Kyanjin Ri. 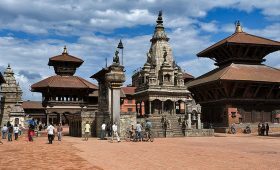 Sightseeing in the World Heritage Sites: Bhaktapur Durbar Square, Pashupatinath, and Boudhanath Stupa. One of the most favorable treks during May is Upper Mustang Trek. It is a privilege to trek to the exotic land beyond the Himalayas. Mustang, or the ancient kingdom of Lo, as it was once known, was an independent fiefdom tied by geography, language, and culture to Tibet. This trek is a journey to a remote place, untouched by any kind of modernization. The lands are dry and barren. But still the land is captivating and this place is full of monasteries, monuments, and ancient culture. The view of Kali Gandaki valley and river bays around the Kagbeni will provide the lifetime experience for all the trekkers. Exploring the Kali Gandaki River valley. Picturesque views of the Himalayas. Ghorepani Poonhill Trekking is one of the easiest and shortest treks in Annapurna region. It is a great option to trek Poonhill in the month of May. Poonhill trek starts from Nayapul after one and half hour drive from Pokhara. This trek passes beautiful villages of Ulleri, Ghorepani, and Ghandruk. 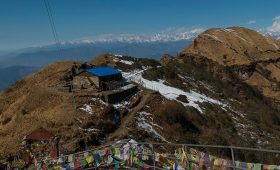 You can enjoy the best sunrise and Himalayas view from the viewpoint on Poonhill (3,210m). You can also enjoy the trek in the spectacular mountain scenery, delightful villages inhabited by Gurungs and Magars. This is the best trek to explore the beauty of the Annapurna region in a short period of time. 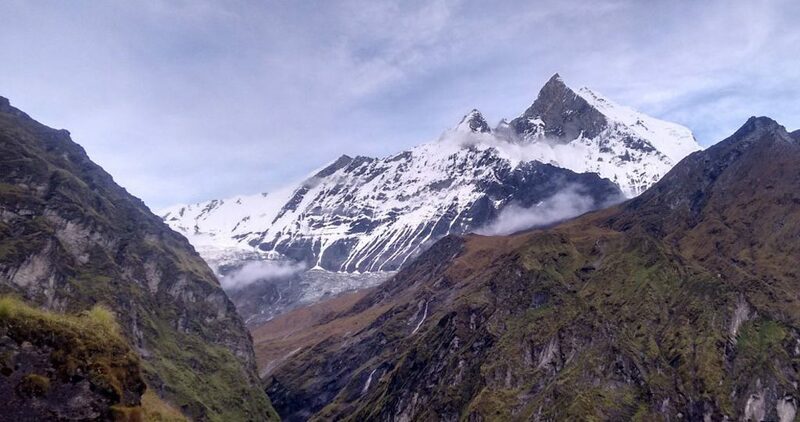 Having the Himalayas close up, it will be a breathtaking moment for all the trekkers. Easy and Short trek in Annapurna region. Renjo La pass trekking is a beautiful adventurous trek in Everest region. This trek is one of the best famous Nepal high passes trekking. Renjo-La Pass Everest Base Camp trekking offers the exploration of the remote but rich areas of Khumbu region. Renjo-La Pass (5360m) is one of the three high passes of Everest region. The high pass of Renjo-La hosts an amazing view of the mountains. The trekkers get to see the panoramic view of Everest (8848m), Cho Oyu (8201m), Lhotse (8516m), Ama Dablam, Makalu (8481m). And, many other snow-capped mountains of Khumbu region throughout the trek. Stunning view from Renjo-La Pass. smooth walking up and down through the dense Rhododendron and Pine forest. Gokyo Chola Everest Base Camp is a trek through the gigantic mountains. The turquoise blue water of Gokyo Lake and the Ngozumpa glacier-the largest glacier of the Himalayas. It is the adventurous trek into the Everest/ Khumbu region which combines the Everest Base Camp with the Gokyo valley. And the high Cho La pass at the elevation of 5420m. The sights of Gokyo Valley has a collection of stone houses and meadows on the shore of a great lake, Dudh Pokhari and the massive Ngozumpa glacier. Encounter the turquoise water of Gokyo Lake. 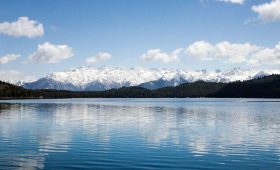 Sensational views of the array of high snow-capped mountains and dramatic landscapes. While trekking in May, breathable rain gear is essential. A good pair of a comfortable hiking boot with firm grip is advisable for muddy and slippery trails due to rain. You should pack trekking pants, shorts, and shirts for lower region. And, warm fleece for evenings and mornings at the higher elevation. Remember that humidity can build up in May with sunny, hot and wet days. Hence, dressing in a layer is the way to go so that you can remove or add clothes according to your needs. A light sleeping bag can come handy while sleeping in the tea houses in the higher altitudes. Trekking in May has a lot of advantages like a clear view of mountains, less snow due to the warmer temperature. You can enjoy the fresh air which settles all the dust after the rain. It is good to be prepared with the right gear and waterproof clothing to trek in May. During this month you can find accommodation and a lot of tea houses which makes your trekking more comfortable. Hence, you can definitely consider trekking during May in Nepal. For further question and queries, please feel free to contact us. We are here to guide and assist you in any way possible.